License manager to store both serial numbers and license files. Developer website: Outer Level Corp.
Is there a better alternative to LicenseKeeper? 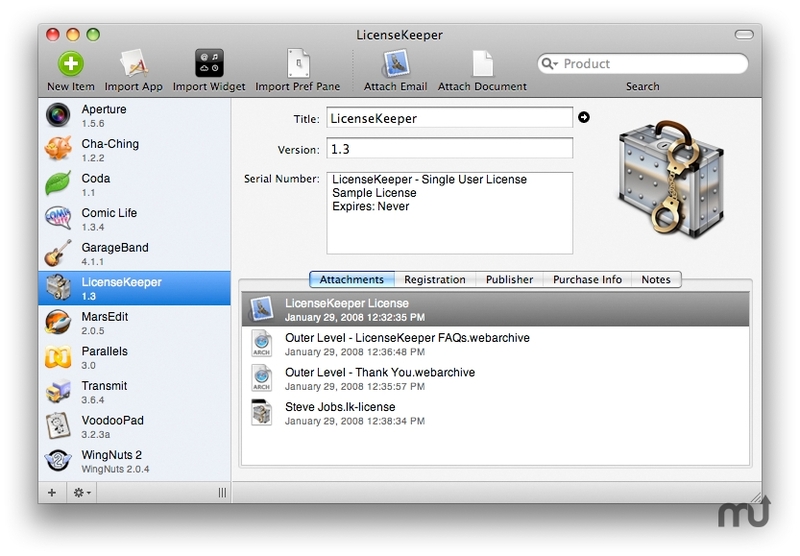 Is LicenseKeeper really the best app in File Management category? Will LicenseKeeper work good on macOS 10.13.4? Automatic serial number scanning and software information detection greatly reduces cumbersome data entry. Attachments keep related email and documents safely archived along with license and registration records. Fixed: beta expiration check incorrectly enabled in public release of 1.8.3. Auto-Scan email for serial numbers - Eliminate tedious and error-prone typing by Auto scanning imported email for serial numbers. LicenseKeeper scans emails for serial numbers and conveniently places them in your clipboard for pasting into your software's registration form. No more hunting for typos in long strings of random letters and numbers. Fast Spotlight-like searching - Your registration information is available, searchable, and ready when you need it most. International Currency -The software market is global and your purchases aren't always in the same currency. Track the purchase price of your software licenses in U.S. Dollars, Euros, Yen, Pounds, or other local currency. Auto-fill user information - Through Mac OS X Address Book integration, LicenseKeeper auto-fills your registration information from your work or home entries. Auto-Save your data - Your data is safe. LicenseKeeper auto-saves your data even when you forget to. Export to XML or Plain Text - Easily export your library to common human-readable file formats -- even if you decide not to buy.